Stephanie: Tell us in just a few words about your project. Gabriel: Our project is mainly focused on telemedicine for teleconsultations. Carlos: We have designed a web based platform that allows doctors to upload images they have taken with their cellphone, with special adapter for their camera to take images that are visible several layers below the skin in order for lesions to be evaluated for a second opinion without the patient needing to traveling. 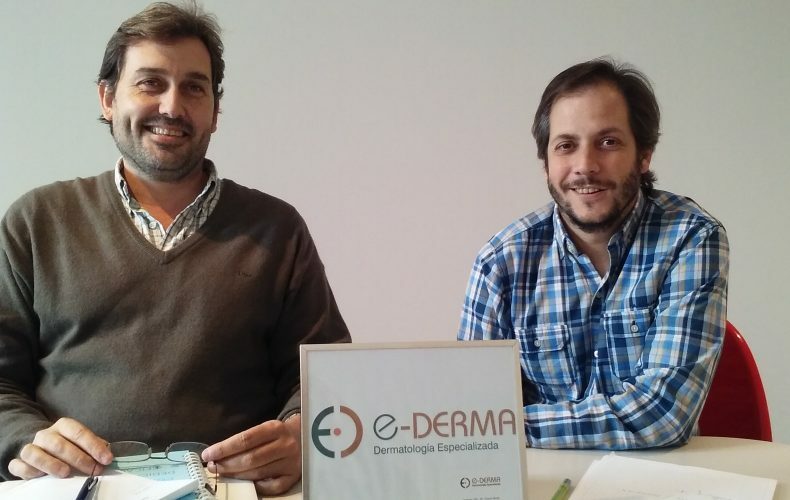 Gabriel: Our main motivation is to eliminate deaths by skin cancer. There was a doctor that said, “no one should die from skin cancer.” Maybe it is a utopia but he is not so wrong. Carlos: There are people who live in remote places or cannot travel who are dying of a disease that can be stopped if they get early treatment. So this is a way that those people can reach dermatologists without having to travel. Gabriel: Yes, our goal is to bring qualified medical attention to remote places where there are no specialists. Stephanie: So in just a few words, you could say that you are saving the lives by earlier and better diagnosis. Stephanie: Great! So then, how was this idea born? Carlos: Wow! What a good question! Haha, we were in Vienna last year for a conference about telemedicine. We were having a couple of beers and we started thinking about how these projects in Europe could be applied to Argentina. Gabriel: In fact, Argentina is almost the same size as all of Europe, so we believe it is perfect for this project as most of the population is concentrated in three or four cities and in most areas they do not have specialists. Stephanie: So your idea was born from inspiration. Gabriel: We were inspired by an idea but then we incorporated new ideas to make it our own and continue growing. Carlos: I think we saw a need and we are trying to respond to that. Stephanie: Great, and how do you think your project will impact Argentina and the Medical industry? Carlos: I think it is a good idea. It is probable that other people will copy our idea. Gabriel: Theoretically it should be a success, but in Argentina, things are very concentrated, and our idea wasn’t born in Buenos Aires. I think that people might think, “Oh, what about the face to face interaction with the patient” but they need to think about the fact that you are saving a lot of money, not just because people don’t need to travel, but also because you are diagnosing things early. In the United States a person with advanced skin cancer will spend nearly a million dollars just in drugs. Stephanie: So do you think that this could be a challenge you will have to face? That the medical industry will oppose to your early diagnosis because their profits are built on late diagnosis? Gabriel: No, not really, because there will always be people who don’t want to get help or physicians that look at a mole and say, “Oh that is nothing” and then they die. Carlos: We are actually trying to gain the trust of other kinds of physicians, not just dermatologists, because they already have a lot of knowledge of skin lesions, but general practitioners, plastic surgeons, and pediatricians, they don’t. Stephanie: What kinds of problems have you encountered so far in your project? Carlos: Well, it is not that other dermatologists don’t like us, but they aren’t as quick to collaborate. Gabriel: We have one of the biggest patient data bases in the nation and most of those people who are referring their patients to us know that we are innovating. They know we are not trying to “steal” their patients. We are trying to reach patients who are outside the system. Stephanie: So then, on a national level, have you thought about providing this project to the public sector? Carlos: Yes, we want to do that as a second step, but we want to start in the private sector and then move to the public. Stephanie: Great! Because those are perhaps the people who need it the most right? Stephanie: So what kinds of challenges have you had to overcome so far in your project? Carlos: Oh, all of our challenges have been technologically based. We wanted a device that would be universal to all cellphones. We couldn’t find one at first so we tried to build our own. Gabriel: It was very difficult. Then we contacted some people from Canada that were working with 3D printers but they were trying to create a device that was compatible with only one kind of phone. We told them we wanted a universal device but they didn’t take us seriously. Then in December of last year a big company launched a universal device and now produce 95% of all devices being used in the world. Carlos: The Canadians called us later and admitted that they should have taken us seriously. Gabriel: But both companies were developing these devices so that patients could send their images directly to the doctor, but I don’t think this is sustainable because there is no control. Imagine, you send your images to a doctor, the doctor says, “No, you are fine” and then the patient dies, then what? Carlos: Yes, with our project, we value the face to face interaction with the patient and the doctor. Then the doctor pays us for our services and charges their patient whatever they want for an expert second opinion. Stephanie: What about legislation? Will you need to lobby new legislation? Gabriel: Well, at the moment there is no legislation. This is a grey situation because while there is no one saying we can’t do it, there isn’t a lot of protection either. And if the doctor follows our advice, who is the responsible person in that situation? Us or the doctor? Carlos: The thing is that many people are already working in telemedicine, but they don’t call it that. Imagine, the doctor who reads tomographies who works from home. The hospital sends the doctor the images and he analyzes them from home and then sends in his analysis. That is telemedicine. Gabriel: The difference is that we are using a new device and a web platform in a very specific area which is skin lesions. Stephanie: Great. Right now, do you have any competition? Carlos: No, not right now, but in the short term, I am sure we will. Stephanie: What about on an international level? Carlos: That is the third stage really. We would love to build a network for all of Latin America, training their experts to evaluate effectively and then they would simply pay for the software and application. Then if they are not 100% sure of their assessments then they can also send the images to us. Gabriel: For example, the number of dermatologists from Brazil is huge, but many of them are aesthetic dermatologists and the incidence of skin cancer in Brazil is huge and is going undiagnosed. Stephanie: How do you plan to profit from this profit? Carlos: To begin with we plan to charge for a normal consultation. But the idea is that, in the future, the private sector would pay for that service. Gabriel: Yes, like they would pay a monthly fee to have the services and they they could charge their patients accordingly. We didn’t start this project with the idea of making money. Of course we have to live but that isn’t the most important part. It is more about saving time and lives. Stephanie: O.K. great, and this is my last question for you today. What percentage of certainty do you have when you make an evaluation? I mean, is there a margin of error in your diagnosis? Carlos: The diagnosis 30% over the actual diagnosis. Gabriel: Yes, that means that instead of 60% the accuracy rate will be more like 90%. Carlos: And that is not counting the fact that we utilize a checks and balances system, where both Gabriel and I analyze the image and then compare our assessments. If we don’t come up with the same diagnosis then we sit down and look at them again. Stephanie: So then the accuracy rate is even higher! Stephanie: That is great guys. You are doing really noble work and I am so proud to be helping you perfect your English in the meantime! Thank you for your time!